In the early 1930s, my grandparents lived in one of Chicago's southern suburbs. My grandmother has always been fascinated with Asian clothing, art and culture. When they lived in Chicago they were afraid to go to Chicago's Chinatown because of the crime and violence shown in movies of the day, such as the 'Charlie Chan' movies. It was a shame that they had these fears, because Chicago's Chinatown is a charming place in its own way, especially during the Chinese New Year celebrations. My grandparents missed out on all the entertainment, dining and drinking establishments Chicago's Chinatown had to offer because of fear. Today, it seems as if some people in our society have similar fears - they often fear people who they have been told by the media live different lifestyles than what the so-called 'majority' of people are accustomed to. Unfortunately, these sort of fears keep a certain number of people away from parts of Chicago that in fact are more welcoming than threatening. One of the Chicago neighborhoods that I feel has an undeserved negative reputation is Lake View / Wrigleyville, also known as Boystown. 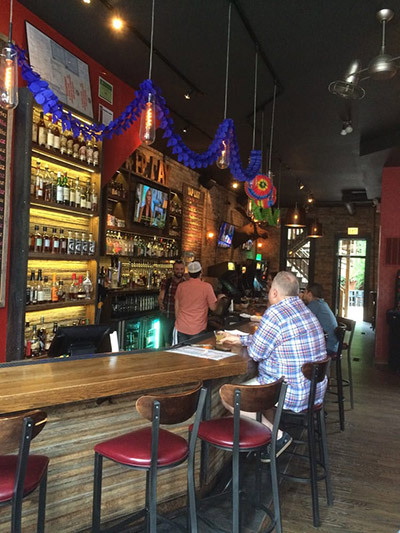 I can say with certainty that there is a good number of interesting entertainment, dining and drinking establishments in Boystown that welcome any and all people that are willing to put aside their fears for just a little while. But what, you may well ask, does this have to do with pinball? That is a fair question for certain, but if you’ll indulge me by reading on, you’ll find out. 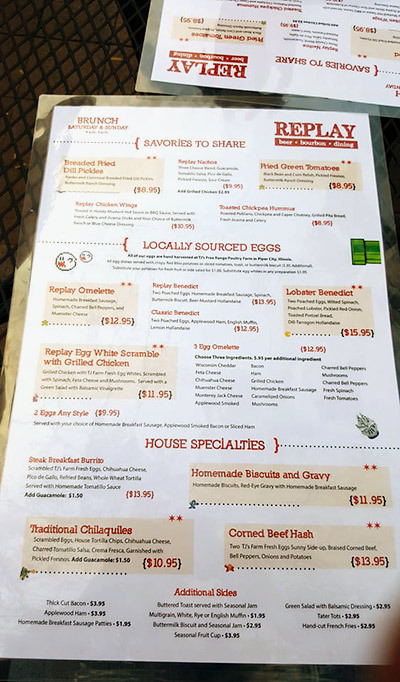 Terri and I were recently invited by friends to join them for an early Sunday brunch in the Lake View neighborhood, with a few drinks afterwards to catch up with each other's lives. 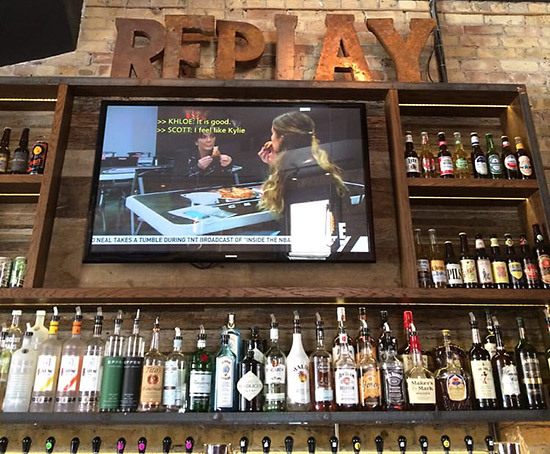 After a great brunch of omelettes and bottomless mimosas at SIP near the intersection of Southport and Irving Park, our intrepid crew went south on Clark Street, past Wrigley Field to a local place called Replay Beer and Bourbon. Replay is located on the famous Halsted Street gay bar 'strip'. During our visit the neighborhood was still recovering from the Saturday St. Patrick’s Day parade and festival of debauchery. 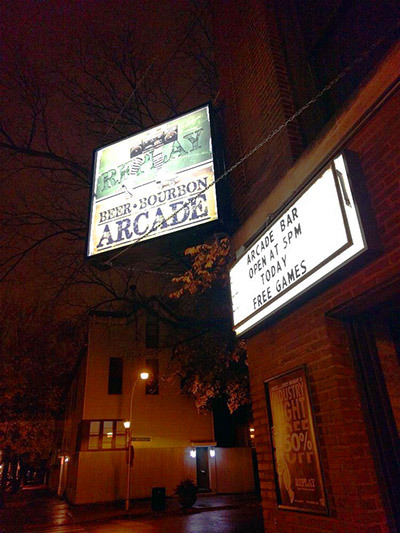 Somehow Replay hadn't popped up on my radar as a place to visit, but it is a very interesting and in many ways unique retro barcade. Replay doesn’t have a particularly impressive or inviting exterior but that all changes once you show the doorman your ID (21+ only because they do not have a kitchen) and your eyes adjust to the relatively dim lighting of the interior. The first thing that I noticed inside Replay is that it has quite an impressive collection of vintage video games along the walls of the bar, including Galaga, Donkey Kong, Ms. Pac-Man, Frogger, Asteroids, Mortal Kombat, Burgertime, Super Mario Bros., Cruisin’ World (twin), and Centipede. Closer inspection showed that these games are all set to ‘free play’. 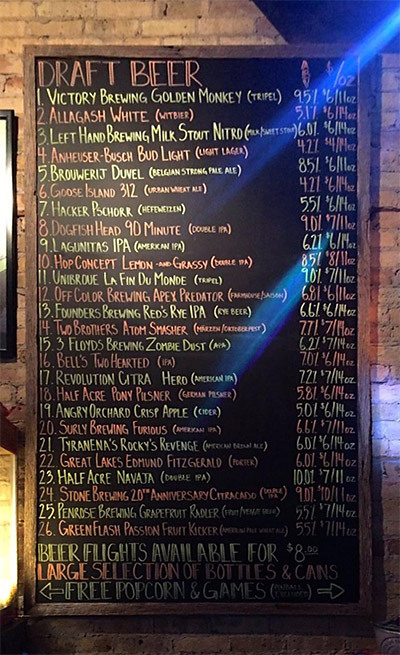 Having wrapped my head around that, I also found over 25 beers on tap; the majority being craft beers, with some favorite mainstream beers thrown in. The bar tender told me that they also have seasonal beers on occasion. 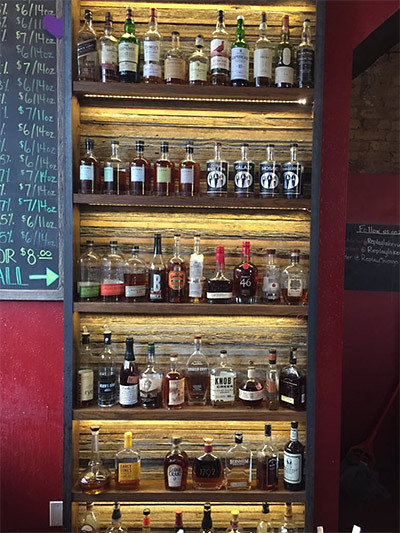 Add to THAT a countless array of bottled beers, over 40 bourbons, 18 whiskies, 13 scotches and 9 brands of rye. Wow! 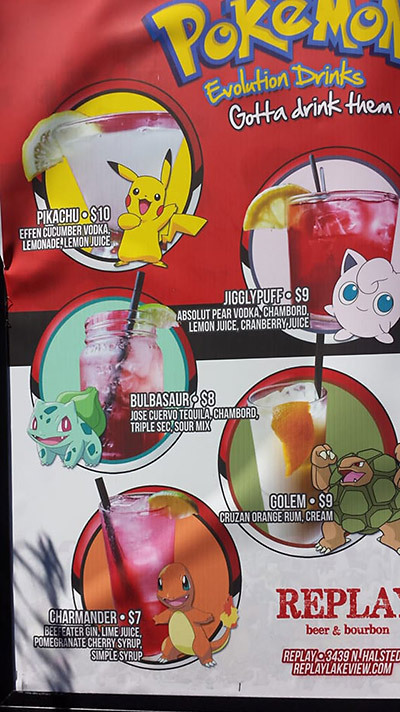 Replay’s mixed drink menu also features Pokemon specialty drinks such as the Pikachu, Jigglypuff, Bulbasaur, Golem and Charmander. cleverly presented with the tagline “Gotta Drink Them All”. Free popcorn actually worth eating! Outdoor patio/beer garden (in the summer months) with its own bar. A networked jukebox with an impressive selection of tunes. And '90s television reruns on the video screens (e.g. American Gladiator) unless there is sports on (usually soccer). Whew! I’d say that’s a lot to offer; but still no pinball mentioned yet. What’s up with that? 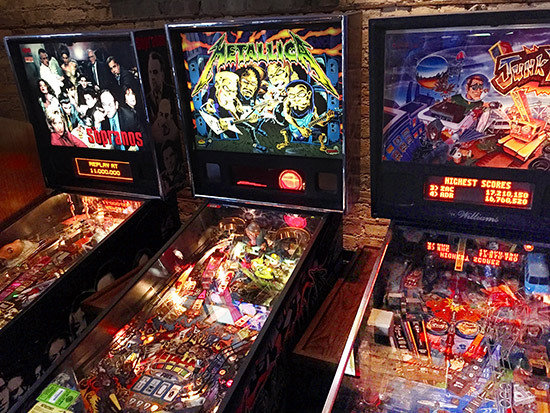 I’ll be totally honest and confess that I didn’t think there was pinball at Replay, until by chance I happened to the furthest corner away from the entrance where there were three shiny and well maintained pinball tables just waiting to empty my wallet of dollar bills. 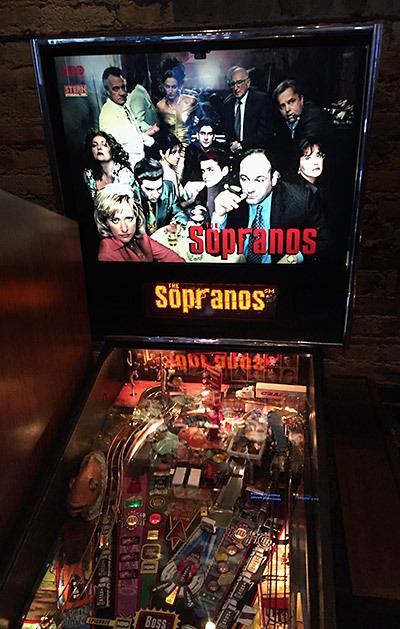 All three games appeared to be in excellent condition, but I am told that the one machine that we weren’t able to play (The Sopranos) had a couple of things broken on the playfield, although it was still playable. All games were $1 for a 3-ball game except for Junkyard which is also 6 games for $5. It’s a shame that they aren’t set to free play like the video games but I guess you can’t have everything. 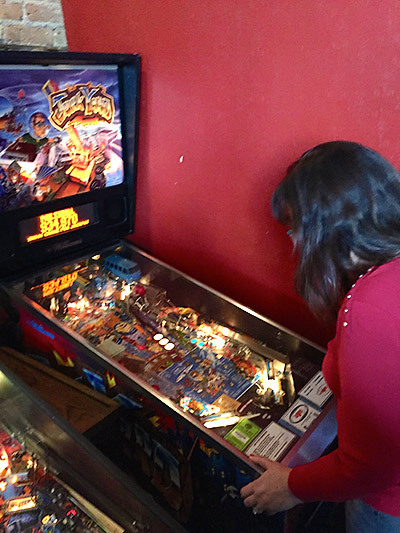 The easiest way to find the pinball games is to look for the Ms. Pac-Man game and then do a 180-degree about-face. 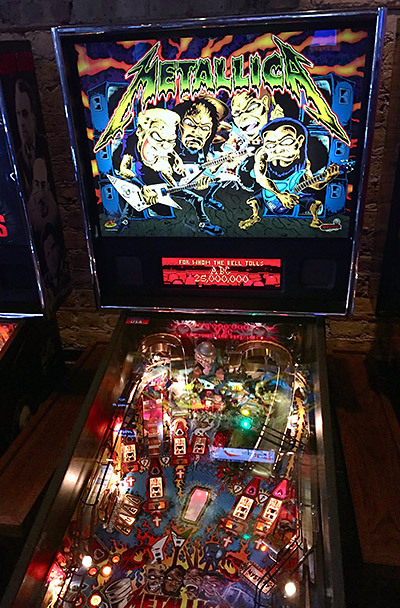 So in summary, Replay Beer and Bourbon is a place that is fun and welcoming, that has pinball and I had no idea existed. I hope that if you are in that area for a sporting event or concert at Wrigley Field that you will take a short walk or hail a cab to Halsted, north of Newport, and check out what Replay has to offer.